Note: An English version of this work entitled Remarks on Color and a Spanish version entitled Observaciones sobre los colores also exist in an edition of five and one artist’s proof, and unique exhibition versions have been recorded in French and Portuguese. Bemerkungen über die Farben [Remarks on Color] is a video/sound installation which uses projection literally and metaphorically to set up an ambiguous space of readership and reception where meaning, sometimes mutated, broken or perhaps reopened, is ultimately transmitted in the spirit of play. Through a child’s spontaneous reading of philosophical questions on the nature of color, a different “coloration” to Wittgenstein’s idea of language games unfolds. Bemerkungen über die Farben [Remarks on Color], Part 1, consisting of 88 segments, is read in real time over a period of 45 minutes. 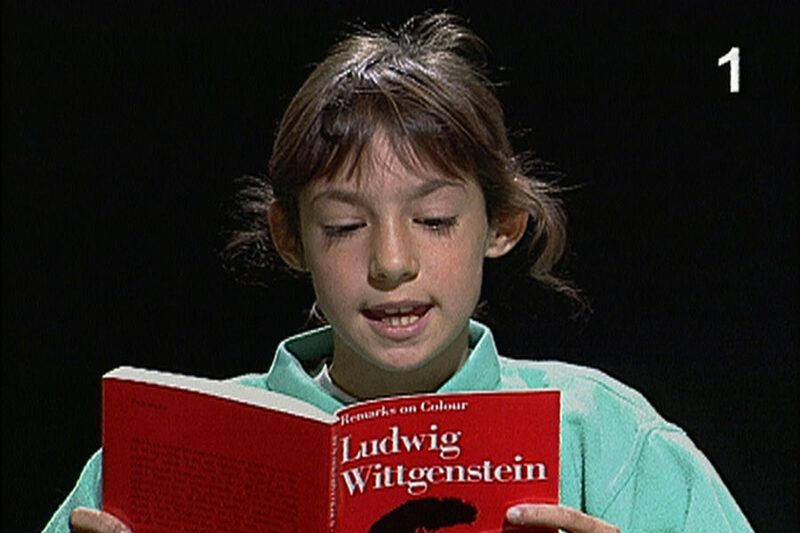 The set, the child’s clothing and hair color, and the bright red book itself become visual references throughout a reading where the reader/viewer experiences “color,” “language,” and “play” in new ways. Gary Hill: Selected Works and catalogue raisonné. Wolfsburg: Kunstmuseum Wolfsburg, 2002, GHCR 85, pp. 183. The German version of Remarks on Color was recorded in Basel, Switzerland, and created especially for the exhibition “Imagining the Brain Closer than the Eyes,” at the Museum für Gegenwartskunst, Öffentliche Kunstsammlung Basel, October 29, 1994 – January 29, 1995. An example of this work was exhibited for the first time as part of “Imagining the Brain Closer than the Eyes,” at the Museum für Gegenwartskunst, Öffentliche Kunstsammlung Basel, Basel, Switzerland, October 29, 1994 – January 29, 1995. “MultiMediale 4,” Zentrum für Kunst und Medientechnologie, Karlsruhe, Germany, May 12 – May 21, 1995. “Rewind to the Future,” Bonner Kunstverein, Bonn, Germany, December 1, 1999 – February 13, 2000. 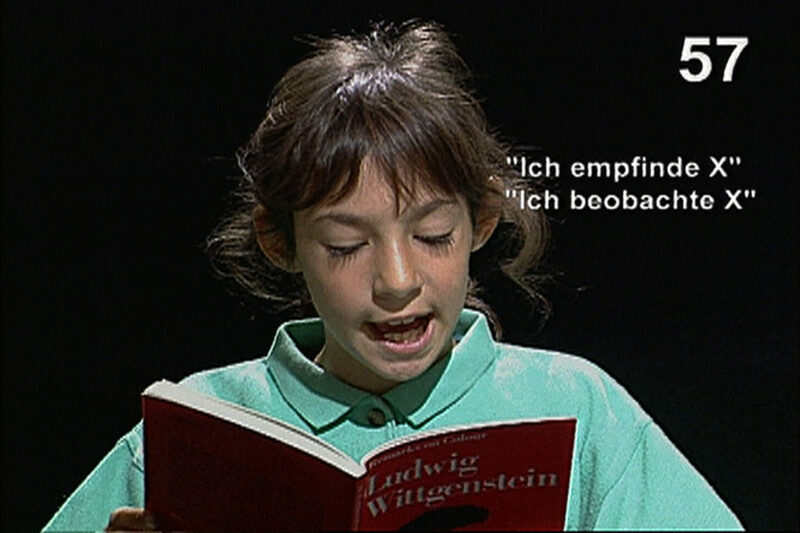 “Les enfants terribles, le langage de l’enfance dans l’art 1909 - 2004,” Museo Cantonale d’Arte, Lugano, Switzerland, October 10, 2004 – January 16, 2005. “Holbein to Tillmans, Prominent Guests from the Kunstmuseum Basel,” Schaulager / Laurenz Foundation, Basel Switzerland, April 4 – October 4, 2009. “IRIS. The Invention of Color from 1600 to Today [IRIS. Die Erfindung der Farben von 1600 bis Heute: Farbe in der Zeitgenössischen Kunst],” Neuer Kunstverein Giessen, Germany, November 20, 2010 – February 6, 2011. Dantas, Marcello. Gary Hill: O lugar do outro/where the other takes place. Rio de Janeiro: Magnetoscópio, 1997, p. 15. Hürzeler, Catherine. “Kann man auf abstrakte Weise surfen? 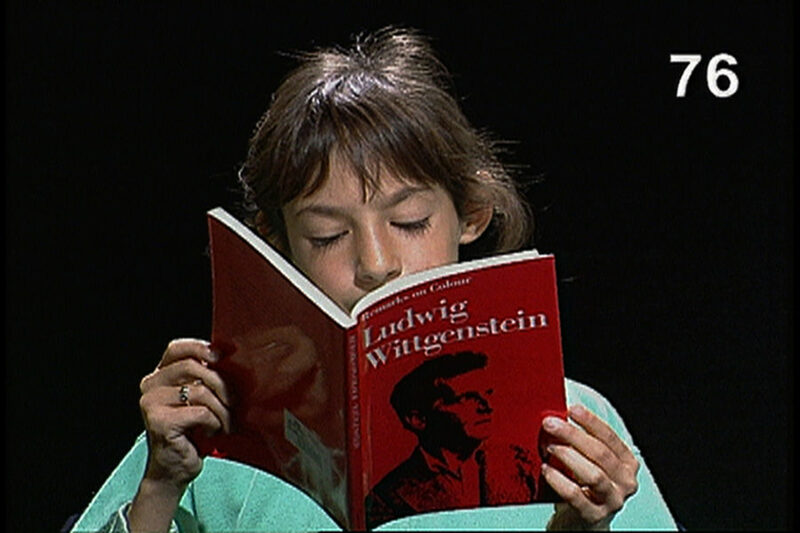 Ein Gespräch mit dem Videokünstler Gary Hill.” Das Kunst-Bulletin 9 (September 1997), pp. 15, 18. Der elektronische Raum: 15 Positionen zur Medienkunst. Bonn: Kunst- und Ausstellungshalle der Bundesrepublik Dueuschland, 1998, pp. 155 – 158. Rewind to the Future. Bonn: Bonner Kunstverein, 1999, pp. 24, 78 – 79, 161, 182 – 183. Gary Hill: Selected Works and catalogue raisonné. Wolfsburg: Kunstmuseum Wolfsburg, 2002, pp. 30, 31, 183. Goetz, Ingvild and Stephan Urbaschek. Fast Forward: Media Art Sammlung Goetz. Munich: Sammlung Goetz, 2003, pp. 200 – 201, 479 – 480. Shaw, Jeffrey and Peter Weibel, eds. Future Cinema: The Cinematic Imaginary after Film. Karlsruhe: ZKM and Cambridge: MIT Press, 2003, pp. 307. Les enfants terribles: The Language of Childhood in Art 1909 – 2004. Lugano: Museo Cantonale d’Arte, 2004, pp. 218 – 219, 233, 265. Quasha, George and Charles Stein. An Art of Limina: Gary Hill’s Works and Writings. Barcelona: Ediciones Polígrafa, 2009, pp. 589. Ludwig Wittgenstein, Remarks on Color, written in 1951. The bilingual edition (English/German), translated by Linda L. McAlister and Margarete Schattle, which was used for the work, was edited by G.E.M. Anscombe and published by Basil Blackwell, Oxford, in 1978.